Isaa Dogboe gets more awards. The annual Sports Writers Association of Ghana Awards came off over the weekend. Furthermore, it was at the Accra International Conference Centre. Moreover, the night was to award the best in Ghana sports over the past calendar year. Also, WBO Super bantamweight champion Isaac Dogboe picked up the flagship Sports Personality of the Year award. Last week, Dogboe made the entire nation and continent proud. Furthermore, this was when he floored defending champion Isaac Magdanelo to pick up the world title strap. Also, other awardees on the night included Atletico Madrid midfielder Thomas Teye Partey winning Footballer of the Year Award, former Hearts of Oak captain Thomas Abbey winning local Footballer of the Year award and Dr Papa Kwesi Nduom being presented with a special award. 2. Alhassan Okine – Kickboxer of the year. 7. Vincent Torgah – Golfer of the year. 27. 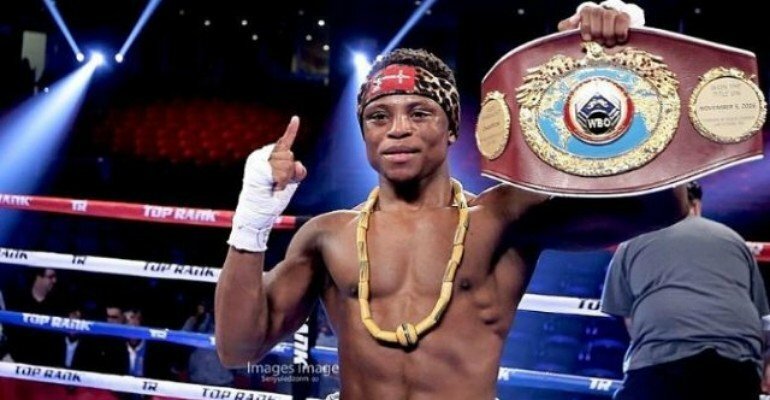 Isaac Dogboe – Sports Personality of the Year.